Just because an executor files a will in probate court does not make the will valid, and a trial ensues if challengers file objections to the purported legal will. While probate rules vary among jurisdictions, common grounds for will contests include fraud, or when someone tricked the testator into making or changing will provisions, for example; undue influence, or when someone pressured a vulnerable testator into making or changing will provisions; and improper execution, or when the will was not signed in conformity with state law. Review a copy of the purported will filed in probate. Read any later-added sections -- termed codicils -- with special care. Note the date the will was allegedly signed and the dates of all codicils. Review earlier wills, if any, comparing provisions and relevant dates. Construct a rough time line of the last years of the deceased's life, inserting will and codicil dates as well as notes on the state of the testator's health and on his medicines or medical treatments during the period. Consider who was with the testator most frequently, how they were treated in the will and whether this was a great departure from prior wills. From this review, identify for yourself the exact circumstances on which you base your objections. 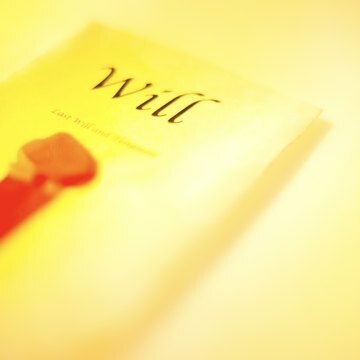 Obtain a copy of the will contest section of your state's probate code from a local law library or the probate court clerk. Determine the statutory grounds appropriate to your objections. While questions of forgery and execution -- whether the testator signed before an appropriate number of witnesses -- are fairly straightforward, fraud and undue influence grounds sometimes overlap. Fraud requires a deliberate intent to mislead the testator in order to get him to alter the will -- for example, a false statement that the testator's son is in prison. Undue influence involves pressure exerted on a vulnerable testator by someone in a confidential relationship with or without misstatements. Draft an objection to the will in the form required by your jurisdiction. Ask a probate court clerk or law librarian any questions that may arise. Include in the document a statement of your standing to contest the will. Most states only permit persons having a monetary interest to challenge a will; if you won't inherit more property by winning the will contest, you cannot contest the will in these jurisdictions. File the original of your objection with the probate clerk within the time allotted in your jurisdiction. The court then assigns a trial date and provides notice to all interested parties. Gather evidence. Collect relevant document and talk to potential witnesses. Tailor your evidence to your argument; the form and sufficiency of evidence varies depending upon the grounds for your challenge. Remember that challengers generally bear the burden of proving allegations of misdeeds such as fraud and undue influence, while those defending the will must establish that it was executed correctly. Appear at the hearing with your witnesses and evidence. Do not attempt to use legal terminology. Present your case in simple, normal language. Convince the court that your challenge is well taken. The court either rules on the will contest after all evidence is presented or, more typically, takes the matter under advisement and mails a written decision to the parties.